I think that FELDENRKAIS is the most low-tech, high tech system for self-improvement out there. Think about it — all you need is a floor to lie upon, or a chair to sit in, and you have a very accurate and personalized biofeedback “device” that will give you a lot of detailed information about yourself, if you stop and pay attention. Once a student “gets this” — how to take the movements into life — there’s no stopping them. Last week at the class at the MD Anderson Integrative Medicine Center, a man shared two really interesting comments with me. Immediately after the lesson (one with tilting crossed legs slowly to the side, noticing details; then slowly tilting arms in the opposite direction) he got up on his feet and then walked around a bit, with a curious smile on his face. 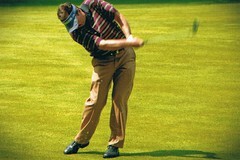 “I hope it’s OK,” he grinned, “but during that lesson I kept thinking about how that twist was really going to help my golf swing.” I told him that was indeed OK – and indeed, it was the whole point — to take the movements into your own life, doing whatever it is that you want to do, or must do. He then shared that he is currently undergoing proton therapy, a very advanced type of radiation treatment, for his cancer — and that he must lie very still within the “tube” during the treatments. “I realized that even when I’m not moving, there’s a lot moving — like my breathing. Maybe I can just THINK about moving while I’m in there — and they’ll never know.” This man got some of his power back that day on the floor, and was looking forward to getting out on the links to try his Feldenkrais-improved swing. How do you take FELDENKRAIS with you? Please leave a comment.